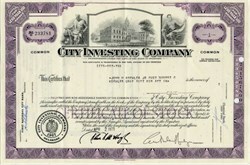 Beautifully engraved uncancelled stock certificate from the City Investing Company issued in prior to 1971. This historic document was printed by the American Banknote Company and has an ornate border around it with a vignette of two allegorical men sitting on both sides of a picture of a building. This item has the printed signatures of the company�s president and is over 23 years old. City Investing was a holding company with units engaged in insurance, manufacturing, housing, real estate and community development. Their holdings included Home Insurance Company, Federal Home Life Insurance Company, Rheem Air Conditioners, World Color Press, General Developemnt Corporation, Guerdon Industries, Motel 6, California Savings and Loan, and more. In 1978 they had over 44,000 employees. Due to financial problems they were forced to liquidate the company.